If one were to list the most important artists of the twentieth century, Henri Matisse's name would surely come very close to the top of the list . Matisse's career has been chronicled in hundreds of books and museum retrospectives (the recent show at the Museum of Modern Art, a longtime supporter of his work, and its giant accompanying catalogue, whose bibliography lists the most important of those, make it possible to easily chart his work and its impact upon the artists of our times). 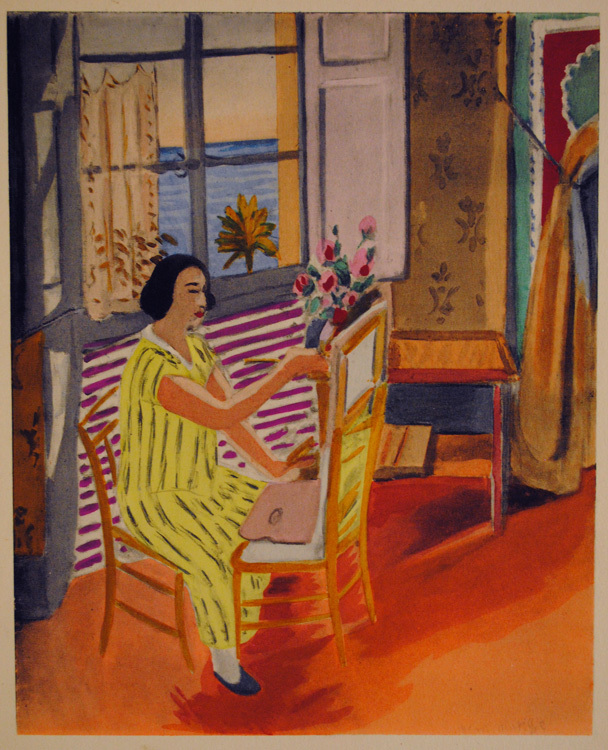 Matisse produced many prints in various media during his life. 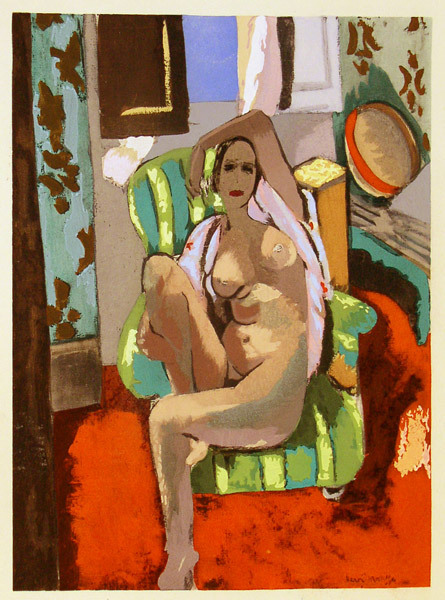 His nudes in lush interiors, his figure stides, his still lifes, all proclaim his mastery of color and line. La branche de Lilas, 1914 / The lilacs. Color pochoir (hand-colored stencil print) after a painting, 1924. Published in L'Art d'Aujourd'hui (Editions Albert Morancé, 1924). 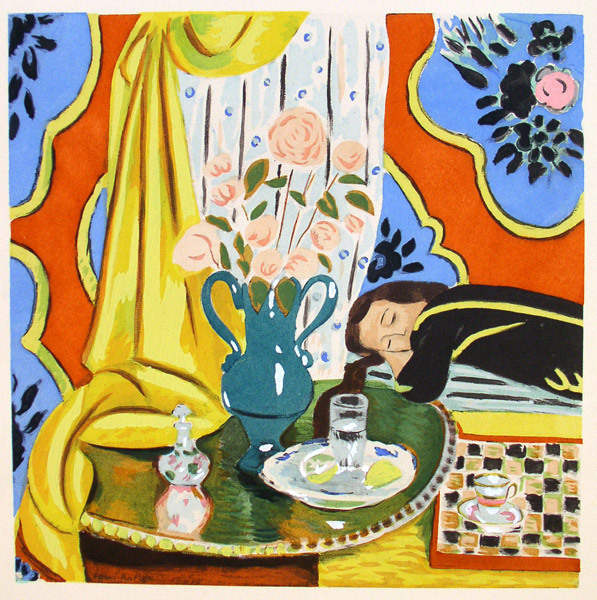 There was a deluxe edition of 100 containing an original signed lithograph by Matisse; the size of the remainder of the edition is unknown. The pochoirs were executed under Matisse's supervision. This beautiful hand-colored piece, based upon a 1914 painting by Matisse, is one of the few early color prints in Matisse's print oeuvre. 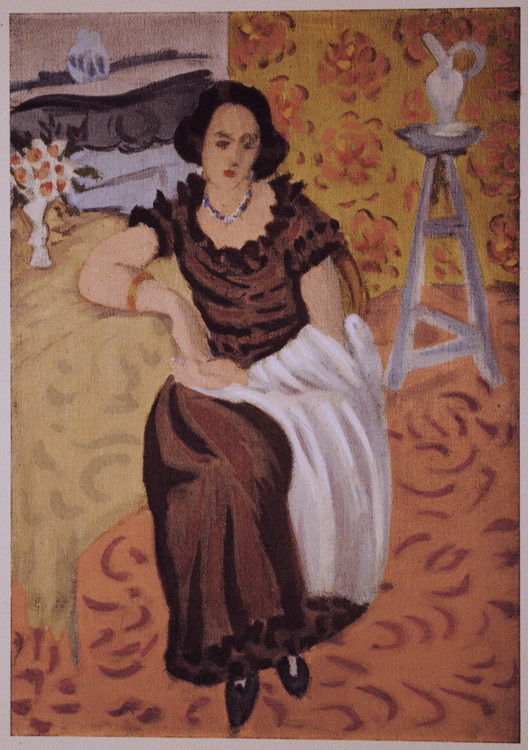 The painting that is related to this pochoir was in the 2010 Matisse show at the Museum of Modern Art, NY. Image size: 212x139mm. Price: $1750. Femme en robe brune, accoudée, 1922 / Seated woman in brown dress. Color pochoir (hand-colored stencil print) after a painting, 1924. Published in L'Art d'Aujourd'hui (Editions Albert Morancé, 1924). There was a deluxe edition of 100 containing an original signed lithograph by Matisse; the size of the remainder of the edition is unknown. The pochoirs were executed under Matisse's supervision. This beautiful hand-colored piece, based upon a 1924 painting by Matisse, is one of the few early color prints in Matisse's print oeuvre. Image size: 179x125mm. Price: $1750. La séance du matin, 1924 / The morning session. Color pochoir (hand-colored stencil print) after a painting, 1924. Published in L'Art d'Aujourd'hui (Editions Albert Morancé, 1924). There was a deluxe edition of 100 containing an original signed lithograph by Matisse; the size of the remainder of the edition is unknown. The pochoirs were executed under Matisse's supervision. This beautiful hand-colored piece, based upon a 1924 painting by Matisse, is one of the few early color prints in Matisse's print oeuvre. Image size: 197x159mm. Price: $1750. La séance de trois heures, 1924 / The 3 p.m. session. Color pochoir (hand-colored stencil print) after a painting, 1924. Published in L'Art d'Aujourd'hui (Editions Albert Morancé, 1924). 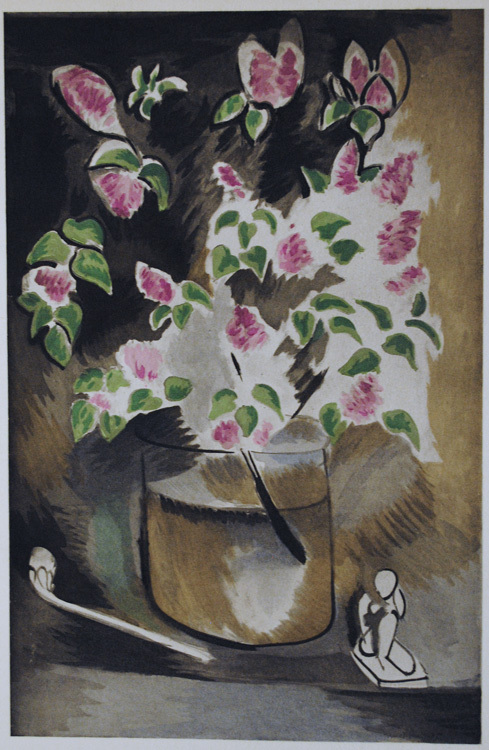 There was a deluxe edition of 100 containing an original signed lithograph by Matisse; the size of the remainder of the edition is unknown. The pochoirs were executed under Matisse's supervision. This beautiful hand-colored piece, based upon a 1924 painting by Matisse, is one of the few early color prints in Matisse's print oeuvre. Image size: 205x160mm. Price: $1750. 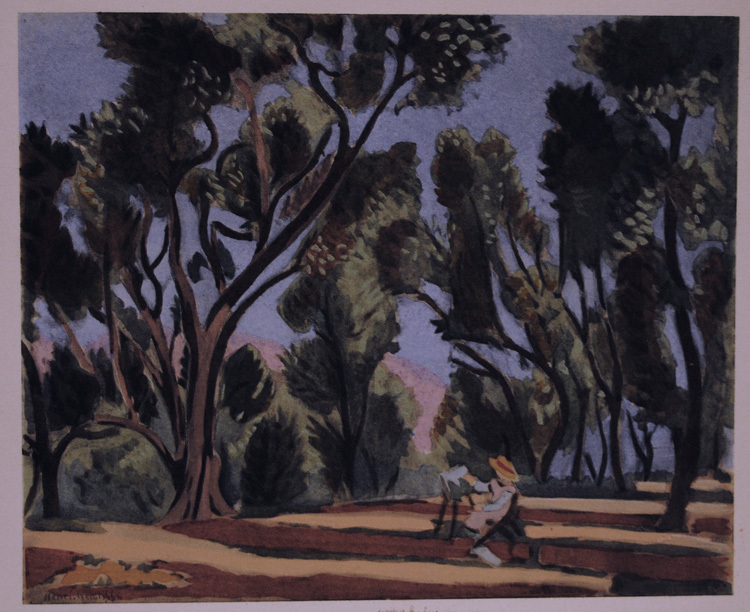 Oliviers, 1924 / Olive trees. Color pochoir (hand-colored stencil print) after a painting, 1922. Published in L'Art d'Aujourd'hui (Editions Albert Morancé, 1924). There was a deluxe edition of 100 containing an original signed lithograph by Matisse; the size of the remainder of the edition is unknown. The pochoirs were executed under Matisse's supervision. This beautiful hand-colored piece, based upon a 1922 painting by Matisse, is one of the few early color prints in Matisse's print oeuvre. The painting upon which it is based is in the Cone Collection where it is titled Painter in the Olive Grove. Image size: 161x197mm. Price: $1750. Odalisque sur fond rouge. Color pochoir (hand-colored stencil print) after a painting, 1929. 500 impressions for Florent Fels' Henri Matisse, published in Paris by XXe Siecle. The pochoirs were executed under Matisse's supervision. 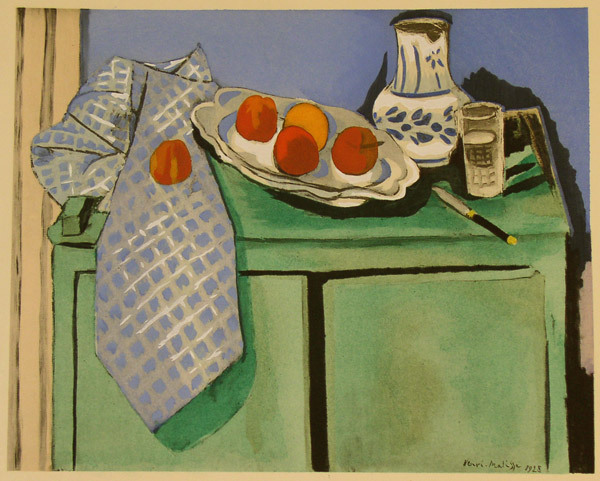 This beautiful hand-colored piece is one of the few early color prints in Matisse's print oeuvre. Image size: 154x224mm. Price: $2,750. 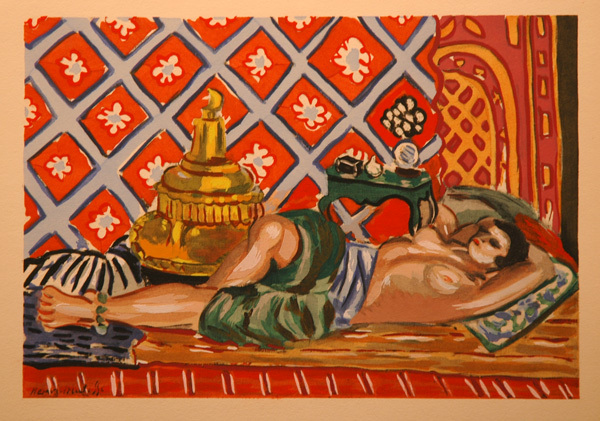 Odalisque au tambourin. Color pochoir (hand-colored stencil print after a study for the painting of the same title), 1929. 500 impressions for Florent Fels' Henri Matisse, published 1929 in Paris by XXe Siecle. The pochoirs were executed under Matisse's supervision. This beautiful hand-colored piece is one of the few early color prints in Matisse's print oeuvre. 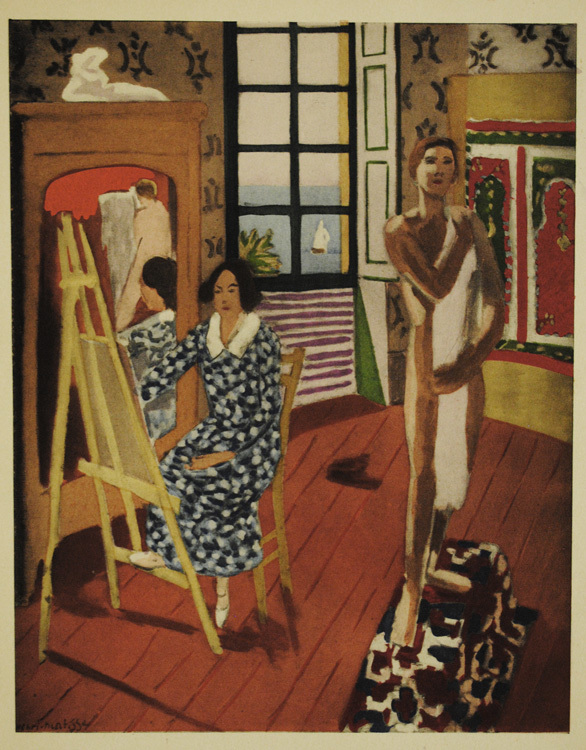 The painting upon which thos pochoir is based is reproduced on the rear cover of Matisse: Painter as Sculptor (New Haven: Yale University Press, 2007) and illustrated within on p. 221. Image size: 223x162mm. Price: $3000. Harmonie jaune. Color pochoir (hand-colored stencil print) after a painting, 1929. 500 impressions for Florent Fels' Henri Matisse, published 1929 in Paris by XXe Siecle. The pochoirs were executed under Matisse's supervision. This beautiful hand-colored piece is one of the few early color prints in Matisse's print oeuvre. Image size: 162x162mm. Price: $3000. Le Buffet. Color pochoir (hand-colored stencil print) after a painting, 1929. 500 impressions for Florent Fels' Henri Matisse, published 1929 in Paris by XXe Siecle. The pochoirs were executed under Matisse's supervision. This beautiful hand-colored piece is one of the few early color prints in Matisse's print oeuvre. Image size: 163x200mm. Price: $3000.